What should I feed marine fish? Good nutrition is essential for keeping marine fish healthy and vibrant. We feed our fish a variety of fresh, frozen and prepared foods in hopes that it will cover all the “nutritional bases” and keep the fish in good shape. Many of us, in the reef aquarium hobby, gravitate towards frozen foods and we leave the prepared (dry) foods to our hyposalinity (freshwater) cousins. So, I thought it would be interesting to have a post about that often ignored (maybe even snubbed) category of food. One reason prepared foods are interesting is that they’ve been manufactured specifically for the nutritional value to the fish. While they may be “artificial”, that doesn’t necessarily mean nutritionally poor. These man-made foods are sometimes based on nutritional research conducted for aquacultured fish species. Scientists have studied the nutritional requirements of high-value food fish, in order to maximize health and growth. 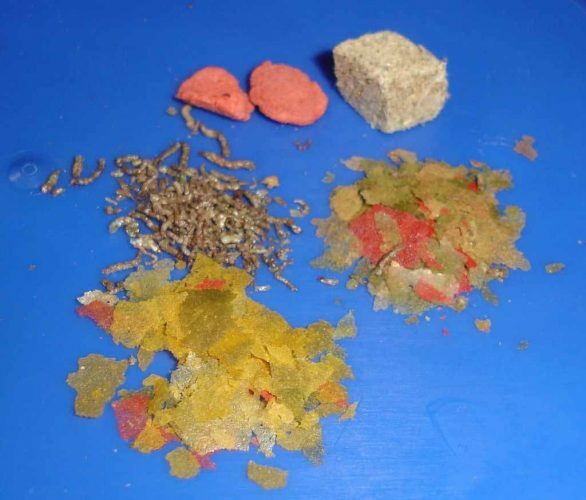 Aquarium fish food companies use this data to formulate flakes and pellets for our reef fish. These formulas are called “complete” diets because they supply all the basic nutritional needs of the fish. Compare this to supplemental foods, which do not contain all the protein, vitamins and minerals required to keep fish alive. Leafy greens, like spinach or kale, are examples of supplemental foods. They are beneficial, but fish can’t survive on this alone. A complete reef fish food will supply essential ingredients in a balanced formula. Let’s take a look at each category to better understand the science behind fish food and marine fish nutrition. Fish need a continual supply of amino acids for growth and maintenance. Marine fish nutrition comes from essential amino acids found primarily in high-protein ingredients such as fish and shrimp meal. If dietary protein is too low, growth slows and fish begin extracting protein from their own tissues. If fish food contains too much protein, the excess is metabolized and excreted as ammonia. Protein ingredients are very expensive. Plant-based alternatives, such as soybean and pea powders, are proving to be good alternatives to fish meal. The protein level in prepared marine fish foods is quite high, between 40-60%. Carbohydrates are utilized by fish as a quick energy source. Although there is no scientifically proven requirement for carbohydrates in fish diets, it is beneficial in aquarium feeds. Starch is added to fish foods to give it structural integrity. Floating pellets rely on starch to hold the pellet together and cause it to float. The high pressure involved in forming food pellets actually cooks the starch. This makes the starch more digestible to the fish. There is some indication the fiber slows the passage of the food down, allowing better digestion and absorption of nutrients. Corn and wheat are two common carbohydrate sources in fish food. Fats provide fish with a highly digestible energy source and supplies essential fatty acids. Fats are also used in the absorption and delivery of vitamins K, E, A and D. Fats make the food tasty for the fish. Marine fish specifically require highly unsaturated fatty acids (HUFA). Fish oils are rich in HUFAs and are often used as a source of fats. Fish oils will eventually decay, turning the food rancid. Antioxidant preservatives BHA, BHT, and ethoxyquin are added to stop oxidation in fish foods. If fish foods contained no preservatives, they would turn rancid very quickly. Feeding rancid foods can lead to liver problems. Vitamins are divided into water soluble and fat soluble groups. The water-soluble vitamins include the B-vitamins, folic acid, vitamin C (ascorbic acid) and others. Vitamin C gets a lot of attention because it is an anti-oxidant that helps fish healthy. Fat-soluble vitamins include A, D, retinol (vision enhancing) and vitamin E. A deficiency of any one vitamin will cause fish health to decline. In general, vitamin deficiencies lead to “pop-eye”, poor appetite and anorexic fish. Vitamins can break down during the food manufacturing process and on the shelf. Fish food manufacturers boost the initial vitamin levels to compensate for this natural break-down. Minerals are used in the formation of bones, teeth, fin rays and scales. Marine fish get calcium, magnesium, and potassium directly from the water. These minerals are added to the foods to satisfy state feed laws, which do not differentiate between freshwater and marine fish. Phosphorus is essential in the diet and is used in a variety of processes such as bone formation and energy transfer. A trace amount of iodine, copper, and zinc are required for enzymes and hormones to work properly. A lack of zinc shows up as cloudy eyes. Keep in mind that relatively few species-specific fish diets have been investigated. For the aquarist, the best approach is to feed a variety of foods-frozen, fresh and prepared. This is not only fun, but it also helps you find out which foods each species likes. Feeding a variety ensures your fish are getting all the essential nutrients they need to stay healthy. Keeping pelleted and flake food fresh is important. If the food gets wet or is stored open to the air, the essential fats will begin to break down. This will also speed the decay of vitamins. Keep food containers sealed. Do not put wet fingers into the food container! Some nutritional experts recommend never keeping food longer than 90 days. Although that huge container may look like a bargain, chances are after a few months the nutritional value will have started to decline. Buy what you will use in a couple of months. Your fish will appreciate it! Some fish are picky eaters and won’t eat dried foods, like the foods described here, so getting the proper marine fish nutrition can be a challenge. Some fish, like certain angelfish and butterfly fish, have special nutritional requirements that make them pretty difficult to care for in a saltwater aquarium. The best-prepared food in the world doesn’t stand a chance at helping keep a fish with special dietary needs healthy. Above all else, know what your fish needs to be healthy…and feed them that first. Assuming you have those unique nutritional needs covered…check out some of the prepared (or frozen) food options. Want more? Check out the recipe for the easiest fresh fish food ever. If you’re not already a member, join the Saltwater Aquarium Blog Community. Enter your email address at the top of this page and just click the “Join Now!” button, it’s super-easy.